The eminent English conductor Sir Charles Groves is today remembered not so much for his breadth of repertoire as for his immense contribution to British music, which he continuously promoted, performed and recorded throughout his professional career. 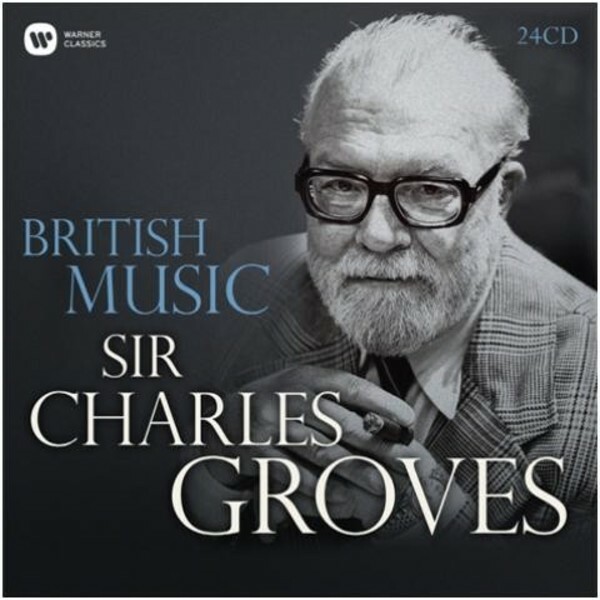 Featuring a wide variety of genres – from symphonies and operas to popular marches and film music excerpts – this special 24-CD compilation pays tribute to Groves’ remarkable achievement, bringing together works by many of the composers who were at the heart of the conductor’s commitment in a selection of authoritative recordings that survey over 100 years of glorious British composition. Charles Groves was too young to have known Elgar, Holst and Delius personally, but when he was growing up, a chorister at St Paul’s Cathedral and a pupil at the Cathedral School, they were the dominant names in British music. Although Groves’ training and temperament helped to form his character as an all-round musician, British music was always important to him, and British composers featured strongly in his friendships and professional relationships. He’d played percussion in a performance of Hugh the Drover whilst a student at the Royal College of Music, and a later photograph of him together with Vaughan Williams was proudly displayed in his home: he liked to get close to composers, and considered it a privilege to know and to work with them. He gave the premiere of the Second Symphony by Malcolm Arnold in 1953, and they became close friends, with Groves always championing Arnold’s music. In later life he fought for the Ninth Symphony, whose sparse texture and unremittingly gloomy outlook had led it to be scorned initially. Groves’ attitude was that, if that was what Arnold had written, that was what he meant: this was part and parcel of his reverence for the composer’s art. It wasn’t just established composers either: he was keenly interested in the music of the younger generation, and gave early performances of works by the Manchester School - Alexander Goehr, Peter Maxwell Davies and Harrison Birtwistle. The young Simon Rattle was a regular attendee at Groves’ concerts during his time as principal conductor of the Royal Liverpool Philharmonic Orchestra, and recalled “If a wonderful new piece arrived like, for instance - 1970 I think it was - Birtwistle’s Triumph of Time, Charlie heard about it and that would be the beginning for the next season.” This was a constant in his life: in 1987 he conducted the premiere of a RLPO commission by the nineteen-year-old Kenneth Hesketh. When he took the RLPO on tours of Germany and Switzerland in 1966 and 1968, and Poland in 1970, and when he was invited worldwide as a guest conductor in the last decade of his life, he always offered British music. He was especially noted as a conductor of large-scale works: after sharing a BBC SO tour of Japan with Pierre Boulez in 1975 (where he included music by Walton, Delius, Tippett and Britten), he was invited back to give the Japanese premiere of Delius’s 'Mass of Life'. He had been very anxious in advance about the Japanese orchestra, choir and soloists, but it turned out that they were all wonderful, and that the choir had spent two years learning the work. He was particularly moved to conduct 'The Dream of Gerontius' in Düsseldorf with the choir that had sung a performance there in 1901, not long after the premiere in Birmingham. And, at a performance of 'A Child of Our Time' in Houston, he was presented with a “Turn on to Tippett” T-shirt - ironic for someone who’d known the composer since the 1950s.